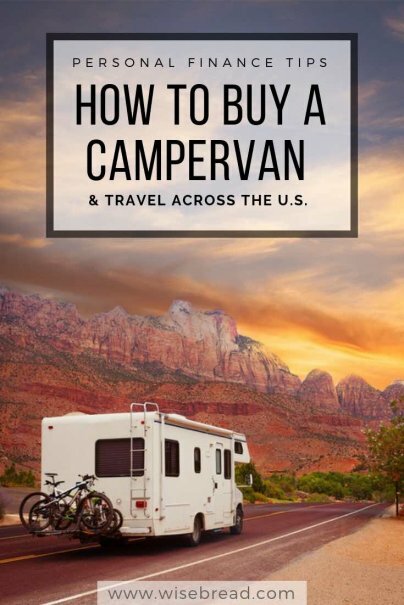 Home » Personal Finance » Cars and Transportation » How to Buy a Campervan and Travel Across the U.S. The mania around vanlife is absolutely everywhere, gracing the covers of glossy lifestyle magazines and filling up our social media feeds. But while it's definitely enjoying a moment, it's also a trend that's not going anywhere anytime soon. The attraction of taking to the open roads with minimal personal belongings is easy to understand, but not everyone knows how to achieve it. If you've got a dose of wanderlust and have your heart set on trying out the van lifestyle, here's how to buy a campervan and travel across the country. The first thing to do when thinking about buying a campervan is to decide whether you're truly cut out for the journey. Many of the Instagram pages and blogs dedicated to this kind of lifestyle make it look both effortless and romantic. In truth, it's not a way of life that will suit everyone. There are a lot of aspects of living in a van that you may not enjoy. The most obvious one is existing in an extremely confined space. And if you're traveling with a friend or a partner, it becomes even more difficult. Keep in mind that it's also unrealistic to believe you're going to be able to keep the van clean at all times. So if you're averse to a bit of grime, you might need to rethink it. There are plenty of options when deciding what type of vehicle to buy, and what you settle on is an entirely personal decision. First of all, you need to decide whether you want to build your own van interior or if you're going to go for a ready-made one. Building your own is part of the appeal for many people and it certainly has its benefits. It's usually cheaper to buy an old camper and convert it yourself, rather than purchase one that someone's already renovated. It also means that you can customize it to your specific needs. Buying a ready-made camper van also has its merits, and even though it may cost more, you'll be able to hit the road right away. If you have don't have the manual skills to renovate or convert a van, then this may be your only option. Do some research to determine what models and makes you're a fan of, then start checking sites like Craigslist and specific campervan sales sites to get an idea of how much they cost. Once you've gotten to know the market, you can make an informed decision. As soon as you see a van that tickles your fancy and checks all of your boxes, don't be afraid to make an offer. Whatever you opt for, it's always a good idea to get a mechanic to evaluate it before you purchase, as you want your vehicle to be as reliable as possible. One of the real joys of traveling in a campervan is the unparalleled freedom. However, it definitely pays to have a rough plan of where you're journey is going to take you. This way, you can avoid some of the stress over where to camp for the night, or where you can pick up groceries. That said, you should still allow yourself the flexibility to enjoy the freedom, whether that be spending an extra night in a beautiful camping spot you've stumbled upon, or checking out a town you're never heard of on a whim. You don't need to have every minute of each day planned, just an outline of some places you want to visit and how to get between them. And don't forget to factor weather into your decision-making. Paying for campsites every night can quickly add up, with some even charging prices up to around $50. So to avoid bankrupting yourself on parking spots alone, you need to work out how to camp in your van on the cheap, or even better, for free. Packing smart is essential to a great van experience. Without some prior planning and an idea of where everything is going to go, you'll end up with too much or too little. Not only that, but your van will be a disorganized mess, which is the last thing you want when you're living in such a tiny space.